There is nothing more Parisian than sitting at a café on a sunny afternoon, a book or maybe a journal at the ready, eyeing passersby as they bustle to and fro, a frothy café creme in hand. Maybe you’re searching for a face in the crowd that will serve as the muse to your next painting. Or maybe you’re deep in reflection, perhaps thinking about the way the light hits the Notre Dame just before sunset, bathing it in golden light, and wondering how this light transforms the world and what that means. Or maybe you’re just taking in the moment, jotting down what you see and hear, waiting for inspiration to strike before you began that next story. Needless to say, when you’re imagining yourself plunking down at a café to throw down 4 Euros or so on a (typically sub-par) coffee, you don’t imagine yourself avec bébé. There is a good reason for this. Babies don’t belong in cafés. Babies scream and fuss and make tons of noise. They spill drinks, clank spoons and smash porcelain onto the pavement (I’m speaking from experience here) drawing death stares from both waiters and the waited-upon alike. Attempting to stuff Zef’s face on the precarious sidewalk seating of a typical Paris café. As if that weren’t bad enough, Paris cafés have bathrooms that are hidden underground down a precarious flight of stairs, generally only traversable by nimble-footed parcours professionals, and many of them contain little more than a hole in the ground coupled with a thimble-sized sink. These bathrooms are dangerous enough for full-grown adults, let alone their pint-sized companions. What I’m trying to say is that, if you’re toting your little one around the City of Light, you can kiss that Parisian café moment goodbye. That’s not to say there aren’t good, if not great, moments at the cafés to be had with your baby in tow. There are! You’ll just have to trade in that moment of quiet contemplation for something a bit more interactive. 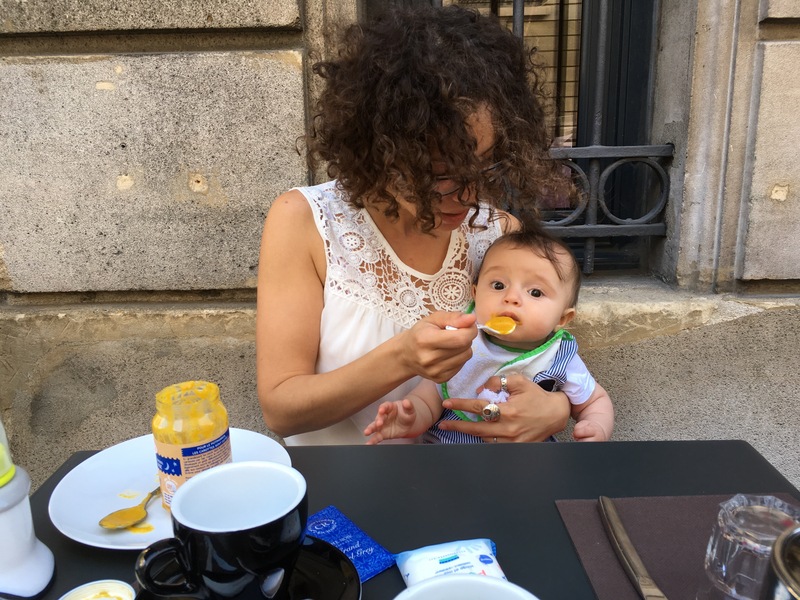 If you’re willing to do this, then there are a number of cafés around Paris that cater to parents who want need their caffeine-fix, but also want need a place to change the poopy tushes of their little spoon-clanking monsters. Perhaps more interesting than the staid cafés of the Left Bank (I’m looking at you Deux Magots and Café Flore) — though not quite the coffee-connessiour confines of boutique coffee shops now dotting Canal Saint Martin and Republique over on the Right Bank (p.s. I love you Foundation Café and Blackburn… keep a place warm for me) — are the baby-friendly confines of some of the neighborhood cafés that cater to the mom crowd (of which I count myself an honorary member). These cafés poussette, or “stroller cafés,” are officially a thing. In my neighborhood (the 15th, around Convention) a short walk finds me at Mombini, the most parent-friendly café I’ve yet to encounter. The advantages of making a place like Mombini your neighborhood café while baby-ing it up (besides the obvious, like a clean bathroom with a changing table) is that while everyone else is out there watching passersby like every other tourist or expat, you can be really rubbing elbows with the locals, exchanging notes about feeding and napping schedules, and also get the lowdown on things like the best restaurants in the neighborhood. If you’re lucky, you might even be able to snag a playdate, which is a great way to get to know Parisians and take that first step in what might be a potential friendship. What every parent loves to see: a clean changing station! Le Café du Monde Entier (95 rue du Chemin Vert, 11eme, Metro Saint-Maur / Voltaire Saint-Ambroise, tel: 01 09 82 54 41 52) is sometimes plagued by slow service (what café in Paris isn’t? ), however there is a lovely group of mothers that frequent this spot and the owner is super friendly, which adds coziness alongside the kids play corner. If the sun is out, the garden of Square Maurice Gardette is just a few short steps away! Le Café Grenadine (161 avenue du Maine, Metro Gaité/Alesia, tel: 01 45 43 99 09) impresses with a decidedly retro feel. Vintage toys and a warm play space are ideally situated for moms (or dads!) to keep an eye on their wee ones while munching on a gluten-free raspberry cake or a lunch lovingly prepared with seasonal veggies. 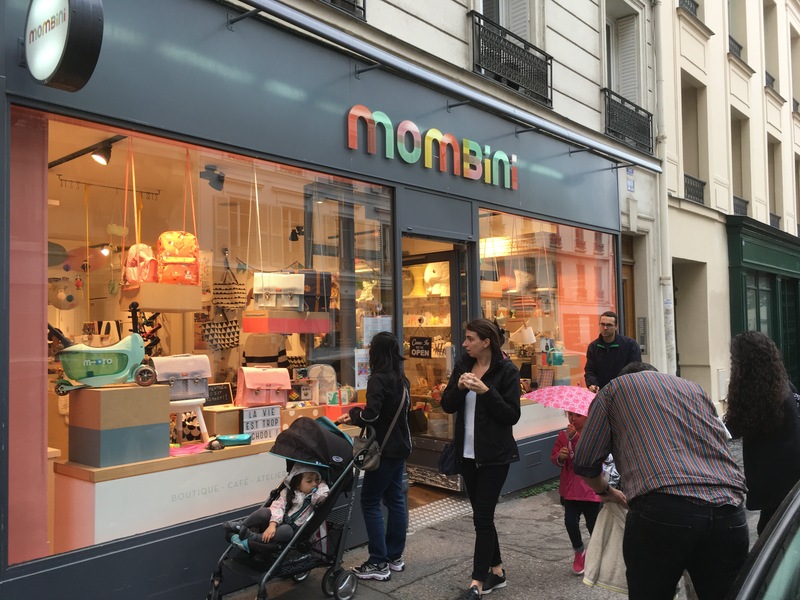 Café Mombini (22 rue Gerbert, 15eme, Metro Vaugirard, tel: 01 73 70 62 31) is my neighborhood haunt. The storefront is filled with wood toys, strollers and other doodads for sale. Upstairs there are separate rooms where they hold classes for kids, such as singing and dancing lessons, while in the back is a fairly big (for Paris) play area for the kids and a number of tables for the adults to chat over their coffees, teas or light lunch. There has been a veritable café boom in the parent and baby-friendly café industry around Paris in the last few years. As Zephyr and I get to make more of our rounds, I’ll keep adding them in. In the meantime, enjoy your coffee!